It's all about me: Yay, the Read-a-thon is here! Yay, the Read-a-thon is here! Dewey's read-a-thon is now an institution in our blogging world. It's here again now and I'm ready! I can't participate for the full one this time, only the first half or so, but hey, it's better than nothing. It's a beautiful day today and it would be a real shame not to get out there, so I'll be going for a walk and hopefully finishing the audio version of Rebecca Stead's When You Reach Me as well. I'm on the last chapter and can't wait to find out what's going on! I'll be checking in once in a while, so see you later. 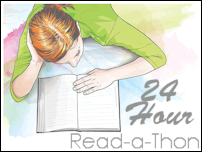 Enjoy the read-a-thon if you're participating too! 1)Where are you reading from today? I'm reading from my home in Tervuren, Belgium. Very close to Brussels. I got married a month ago. I bought a pair of red cowboy boots a few days ago. I grew up in Flushing, Queens, New York. 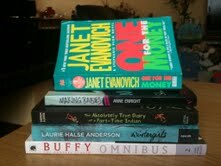 3)How many books do you have in your TBR pile for the next 24 hours? Five real books and the ending of an audiobook. 4)Do you have any goals for the read-a-thon (i.e. number of books, number of pages, number of hours, or number of comments on blogs)? Nope, no goals, just want to enjoy a day more-or-less to myself. My husband's daughter is visiting and they took the baby out for most of the day. Time for me, yay! 5)If you’re a veteran read-a-thoner, any advice for people doing this for the first time? Don't miss out on the blogging aspect, the community fun is amazing! Great books, Joanna. And enjoy the day. I've been looking forward to today for months! Good luck on your reading! Your reading pile looks great. I loved the first Stephanie Plum novel. What a great addition to your readathon books! Good luck and good reading! Red cowboy boots = awesome!